VA Tag: OK2DAY, originally uploaded by shawnblog. yesterday i posted on the myaol blog about america’s love of vanity tags. over 9 million personalized tags… and 1 in every 10 is from virginia. this stat is fun, but also raises some questions in my mind… do other countries have similar cultural phenomena? are american’s really that vain? and what’s so different about virginians vs texans (texas ranked last on the list with only a half percent of drivers)? anyway, it prompted me to go to some photo sites and do a quick tag check on “vanity tags”… i hit the jackpot when i discovered this photo collection by flickr-member shawnblog, and this smaller but excellent collection by flickr-member Jobe Roco. 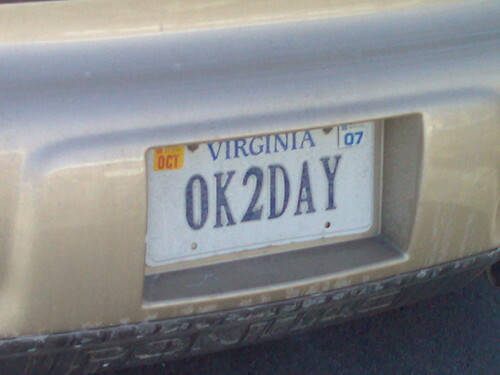 even better is this blog post about happiness and your license plate. “It’s only $10. You can do it online with little effort. You can get a new one every month if you wanted to,” said Benjamin Mace, a Virginia Beach Web designer who started CoolPl8z.com, where people post pictures of their vanity plates. 13 Nov	This entry was published on November 13, 2007 at 11:03 pm. It’s filed under photo entries and tagged license plates, personalized plates, vanity tags. Bookmark the permalink. Follow any comments here with the RSS feed for this post. I think the reason why there are so many in VA is, at least partially, because VA makes it so easy for drivers to check availability online and also because of the considerably lower price. I live in “the other half” of the Washington DC suburbs in Maryland, where it is not at all simple to check availability and annual the fee for “vanity” plates is also considerably higher. Thanks for linking to my collection. It’s a labor of love (and a long story). I’ll pass 2,000 plates soon. Most of them are Northern VA because I drive to work there each day. The other guy’s collection is awesome. It seems that he only gets “hot” cars and more meaningful plates. Very nice!